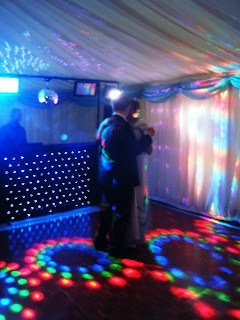 Boogie Disco - Ely and Cambridge Mobile Disco Service: Oh my God! the poor bride can only look in horror as these guys hijack her evening for a few songs. I was grateful when they put their clothes back on and I think the bride and her parents were too!! btw don't be deceived by the size of those speakers. They are JBL PRX615M's ?!?!?!?!? yeah whatever, basically they cost a packet, are extremely loud, and have superb sound quality. What more do you need in a speaker? Of course, I've also been hitting my regular haunt, The Townhouse in Ely, and attempting to educate the Rihanna fans with a touch of quality house music. Don't forget, give me a call, Simon 07775 673185 or email me simon@boogiedisco.co.uk if you need a DJ to pack your dancefloor for you. You can also checkout my website click for weddings or click here for the main site. Nice article that you have posted here. Really, your DJ arrangement is fabulous. If anyone looking for the best Indian Wedding Djs In London at the affordable price, Bliss Entertainment is the best choice.